What Are the Benefits of Swimming the Breaststroke? The breaststroke provides benefits for swimmers of all different skill levels because of its simplicity. Since you control the pace of the stroke, you can swim through the water at a slow pace or swim more rapidly for an intensive workout. Learn the benefits of the breaststroke before your next trip to the pool to get the most out of your swimming session. Most swimming instructors teach the breaststroke first to students, since during the stroke the swimmer's face remains above the surface of the water. As a result, the swimmer always knows his location in the pool, making it less stressful to learn how to swim. Many beginners do not like their head going under the water while swimming, as they lose their whereabouts quickly and panic. The recreational style of the breaststroke allows swimmers to learn at a leisurely pace, without having to swim too quickly. Swimmers use the breaststroke over long distances because it does not use as much energy as other strokes. During the breaststroke, you have an in-sweep, out-sweep and recovery phase for your arms. The recovery phase lasts longer than with other strokes, giving you the ability to rest your body for longer. Your leg kicks also use a longer recovery time, as you extend them after propelling yourself. Strokes using a flutter kick force you to stay in constant motion throughout the swim, but the breaststroke provides an extended period where you allow your previous movements to send you through the water. 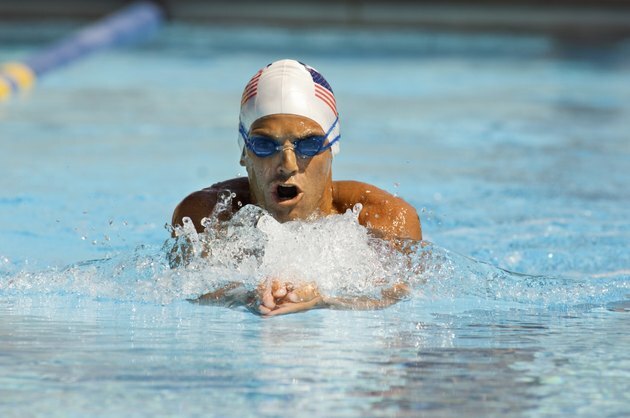 The breaststroke uses many different parts of your body, allowing you to build strength, power and endurance. The arm motion builds your shoulders and back, since it includes both an in-sweep and an out-sweep motion. The kicking motion has similarities to that of a frog, which builds your gluteal muscles and quads. After you propel yourself through the water, you begin the recovery phase, which allows your body to stretch out in preparation for the next movement. Those with previous knee injuries should not participate in the traditional breaststroke, since the kicking motion puts strain on the knees. If you wish to continue using the breaststroke arm motion and protect your knees, switch to the butterfly stroke‘s dolphin-style kick. When using this kick, keep your legs together while bending your hips and knees slightly to propel your body through the water. Slow the dolphin kicking motion down to synch up with your arm movements, since the breaststroke’s arm movements remain much slower than those of the butterfly. Mastering Swimming; Jim Montgomery et al. Does Swimming Tone Your Body?